Welcome to the Lenscraft Newsletter December 2017. This month, I want to share how I fixed a long-term space issue on my computer. If you use photo editing software from the likes of Adobe, Topaz or On1, you probably have lots of wasted space. You also probably don’t know about this unless you’re near to filling your hard drive. Please don't be put off by the technical appearance of the screen shots, this is much easier to fix than it may appear. I also want to tell you about the new Kase filters I have begun to use, switching from Lee. If you use filters and don’t know about Kase Wolverine, you need to read this. Finally, if your fed up with Black Friday/Cyber Monday special offers that aren’t special, I have an antidote – news about the Lenscraft Christmas Gift. When I purchased my last Windows desktop PC, I had it custom built. Prior to this my computers often struggled to run Lightroom / Photoshop. Despite this being a big investment, I still believe it was the right decision. Even now, some 4 years later the PC is very fast and handles huge files without a problem. Despite the great performance from this PC, it hasn’t been without problem. It came with Windows 7 Pro loaded and when launched, I would receive a free upgrade to Windows 10. All the drives in my computer were swapped around and given new drive letters (except for the C: drive). This caused many of my software applications to stop working. Worse still, if you tried to uninstall the “broken” application, the uninstall routine failed. I had to spend hours manually removing these software packages and reinstalling them. Although my C: drive which ran Windows wasn’t remapped, it had another problem. It appeared to fill up, going from about 40% full to over 90%. At this point I need to share a few technical details about my computer hardware. My C: drive is what’s known as a Solid State Drive (SSD) and is only 111Gb. These drives are very fast and very expensive which is why it’s quite small. The design of the computer is that this SSD drive will be used to run Windows, allowing the computer to start up in seconds. The computer is also fitted with a second 250Gb SSD drive where I install applications. This drive is also partitioned to create two further logic drives (50Gb each). These are used as scratch disks by Lightroom and Photoshop. Scratch disks are used for memory caching by both applications when working with large files. Because the SSD driver are many times faster than a standard hard drive (almost as fast as memory), they can dramatically improve performance. You can see my drive configuration in the dialog box below. If you check the C: drive in the screenshot, you will see that it now has 35.3Gb of free space. Prior to the clean-up that I’m about to explain, this drive had less than 1Gb free and would run out of space almost weekly. This was a big headache when you consider all that was installed on the drive was Windows. The reason I realised I had a space issue was because my C: drive is small. Fortunately, because it was a Solid State Drive, the computer performance wasn’t dramatically hurt (it’s now better following the clean up). But had this drive been a traditional hard drive, the lack of space would have slowed it to a crawl. 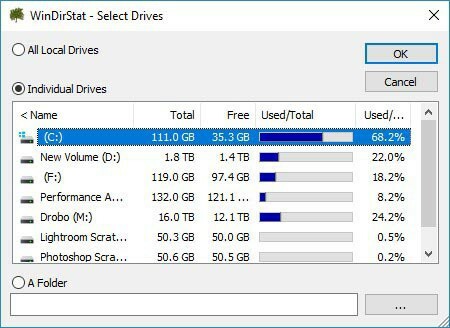 It’s quite likely that you will be able to free up Gb of space on your computer that could be hurting its performance. Here’s how I fixed my problem. I installed a free application called WinDirStat. A quick Google search will give you lots of options for where to download this from (I usually use CNet). 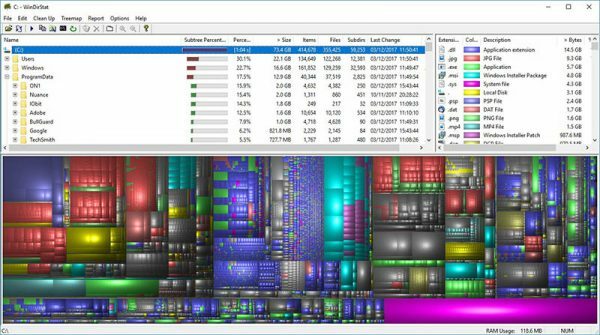 This is a great application that will analyse the contents of a hard drive and allow you to explore what’s taking up the space. When you open WinDirStat you see a dialog allowing you to analyse All Local Drives or Individual Drives. This is the same dialog shown previously above. Run the analysis against one of the drives and you see a screen like the one below. Don’t be put off by this as it’s much easier to read than it first appears. To the top left is the folder structure of the drive that’s been analysed. These folders are not listed in alphabetical order but rather by how much space they take up on the disk. You can see from the screenshot below that my “Users” folder has taken up the most space (22.1Gb) followed by Windows (16.6Gb). To the top left is a list of file types on the disk together with the space they use. In the example below, you can see JPG images take up 9.3Gb which looks like a problem. I would expect to see some, but nowhere near this size. The area at the bottom of the screen shows a graphical illustration of the files on the disk. When you click on a file type using the top part of the screen, the files are then highlighted in white on the graphic as shown below. The squares in the graphic represent files on your disk. The bigger the square, the larger the file. When you click on a square, the file is displayed in the folder tree so you can see what it is. After running the analysis of my problem C: drive for the first time, I could see two huge files. One was called Pagefile.SYS (4Gb) and the other, Hiberfil.SYS was a whopping 16Gb. Following some research on Google I understood what these were. Pagefile.SYS is rather technical to explain but basically, it’s not a good idea to delete this. Hiberfil.SYS on the other hand isn’t essential. Hiberfil.SYS is used by the Windows sleep function. If you don’t use Sleep on your computer, you don’t need it. As I never use the Sleep option (I like to shut my computer down), I decided to turn it off and release the 16Gb of space. If you want to know how to do this, here’s a link to a good article. Now using WinDirStat I could see the problem files and folders. My “Users” folder was the biggest consumer of space; I can’t recall the exact figures, but it was in excess of 40GB. Expanding the User folder and those beneath it, I could see various applications were storing files here. You can see an example below. The largest consumer of space was Photoshop in the Adobe folder. At the time, this had used over 12Gb. By expanding the sub-folders, I could identify the files stored there. Appeared to be the various Custom Brushes and Patterns I had installed. These alone were taking up 1.8Gb of space. Worse still, I could see the different historic versions of Photoshop back to CS5 all contained the same files. Each version of Photoshop had copied the custom brushes and image files I had installed as part of its upgrade but then left the files behind in the folders of the previous version. All I really needed were the brushes and patterns installed in the latest version’s folders. If you’re thinking this is only a problem with Adobe, it’s not. This same approach is followed by many software providers. For example, I had to remove almost 3Gb of data from various Topaz applications. If you look back to the screenshot above, you will see two folders for ON1 and OnOne Software. These both contain historic versions of the same On One software and contain duplicate files, many of them quite large. To provide an example, I recently upgraded from On1 Photo RAW 2017 to version 2018. In the screenshot below, you can see both of these folders within the User folder. This has happened even though I clicked the option to remove the old software during the installation. Notice the two versions both take up 1.2Gb on the disk and rather strangely, both contain 420 files. Expanding these two folders I can see the same folder structure under both. You can see part of this in the screenshot below. When you explore the folders, you find the 2018 version contains the same 1.2Gb of add on files (for example textures) that the 2017 version has. With many vendors now adopting an annual (or more frequent) release schedule, this is a growing problem – quite literally. Following a clean-up of the On1 historic folders my User folder has been reduced from 22.1Gb to 18.9Gb as shown in the screenshot below. At this point I do need to issue a warning. Be careful when deleting files. If you right-click on one of the folders, you will see two options to Delete as shown below. 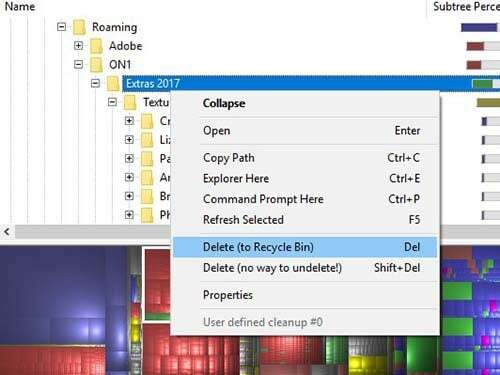 It’s usually best to “Delete (to Recycle Bin)”. You can then try the latest version of the software you deleted files from. If it still works and everything is present, you can empty the Recycle Bin. If you find you have a problem, you will need to restore the deleted files from the Windows Recycle Bin. I also recommend you create a System Restore Point before you start cleaning up your PC. If you inadvertently make a mistake with vital system files, you will have a restore point to return to. Hopefully this article will help you maintain your computers free space and performance. If you follow my Lightweight Photographer blog, you may be aware I have been trying a new filter system. Despite my being a long-term user of Lee resin filters, I have been frustrated by how easily they scratch. I also finding my older filters are not quite as neutral as I thought they were and may have discoloured with time. Following a lot of internal debate with myself, I decided to switch to glass filters. Initially I considered the Nisi filter range when someone mentioned Kase Wolverine to me. Kase Wolverine are relatively new to the UK so I was keen to try them out. On the plus side, they appeared compatible with my Lee filter holder, but the high price put me off. What really changed my mind was seeing a Kase Wolverine glass filter dropped on a stone floor without breaking or suffering any damage. I decided to make an initial purchase of three filters. As I mentioned I was going to use them with the Lee filter holder, the supplier also sent me free replacement plastic inserts for the holder. These replace the standard Lee inserts, which don’t produce enough friction to prevent glass filters sliding in the holder. With the new inserts in place I can use either the glass filters or original Lee filters. I have been using the ND Grad Kase Wolverine filters for a couple of months now and I love them. They appear to be completely neutral. The resist flaring very well, and I can even shoot directly into the sun without flare. When they get wet, water just beads up and rolls off. Another nice benefit is that the focus problem I have when using resin filters with my Fuji long lenses is also resolved with the Kase filters. But the real benefit is when you use the filters to shoot an image. The effect is very difficult to express in words. Images appears to have a clarity that you just don’t get with resin filters. The darkening effect on the sky is also very natural. I have been so impressed by the filters that I asked to become a reseller in the UK and now offer the filters and kits through my Lenscraft Store (https://lenscraft.co.uk/kase-photography-filters-kits/). At present I can supply a range of 100mm filters and kits. I also have a more limited range of 150mm filters and kits, but I don’t yet have these in the store. 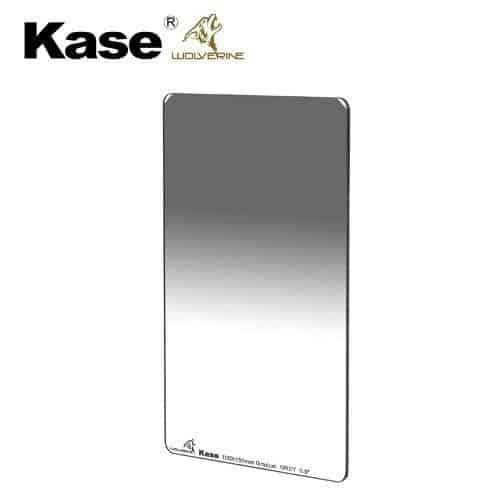 If your thinking of trying glass filters I would very much encourage you to consider Kase. I have been working on the Christmas Gift for a couple of months now. The question that keeps coming to mind is “am I attempting too much”? I’m hoping the answer to this is no but I’m running out of time. If I can pull this off it will certainly be my best gift and may even be the best I will ever be able to offer. For now, I’m going to keep you guessing as to what the gift is, but it relates to my recently published book (Mastering Photoshop Masks). Assuming all goes well, I will be sending out an announcement towards mid-December. Unlike previous years, this gift will go on sale at full price in the New Year, so it’s essential you act quickly when you receive the message. Thank you Robin for your Christmas free gift, I have downloaded the tutorial and did purchase your book shortly after you advertised it. I have not had much time as yet to really look at it but what I have seen is very good. I always use Revo Uninstaller for uninstalling programs. It cleans out all the leftover files & Registry entries. Ashisoft’s Duplicate File Finder is also very useful at finding and removing file duplication. 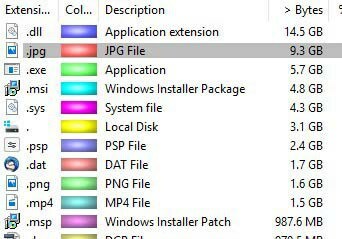 The Windows Swapfile is only used for paging out memory, so if there is sufficient physical memory in the PC, it gets little or no use, so can be set to a small size. I think it’s still worth running WinDirStat. I have also had a few people email me to say you don’t have this problem on a Mac – I have bad news. You have exactly the same problem on the Mac. I just cleaned up 100Gb on my main Mac and there is much more I could remove. If anything, it appears worse than Windows. Attempted to comment once but site is not forgiving (captcha error). Win 10 performance (and PS performance) is affected by Win setting, some of which you cover. Set advanced properties to ‘performance’ and you can also place and size the swapfile (Win Cache). I can offer particulars if interested. It looks like your first posting was accepted. My experience with Win 10 is similar to yours. Net: set advanced properties to ‘performance’; then you can also set the size and placement of the swapfile (Windows Cache); you can get a significant change in performance by playing with these settings. If anyone is interested, I can offer particulars. I also have an SSD drive for my C: drive and Win install. I try to keep it as small as possible for various reasons.